Even though Tom Hanks was on hand to lend a little legitimacy to the sketch comedy proceedings last night, Jonah Hill's second go-round hosting Saturday Night Live was mostly unfunny. 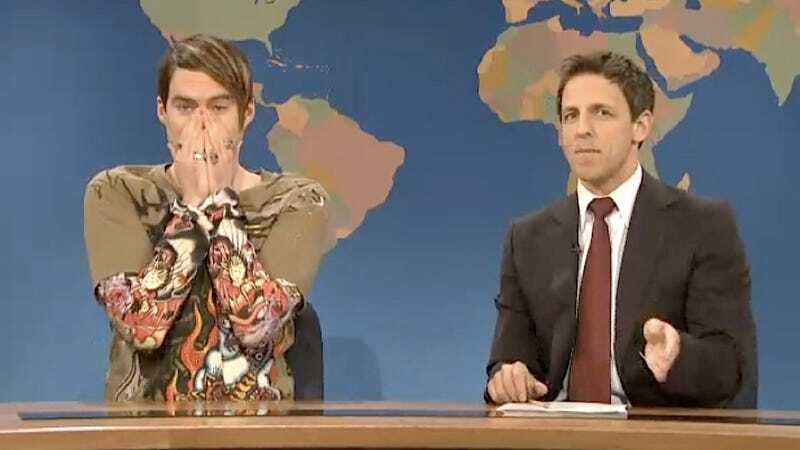 I say mostly, of course, because Stefon dropped by the Weekend Update desk to tell everyone about the most off-putting New York clubs, including Kevin?, a club in a Long Island Lady Footlocker run by "infamous gay running back, Blowjay Simpson," who serves football jellyfishes to anyone wanting a concussion. Bill Hader had a hard time keeping a straight face through this thoroughly hilarious litany, which proved to be a little island of humor in a grey sea of bleh. The monologue was pretty funny too, I guess, but only because Tom Hanks taunted a trophy-less Jonah with his Oscars. That's right, Tom Hanks — you remain undeniably likable and a great American.